Non-fiction to engage reluctant learners. 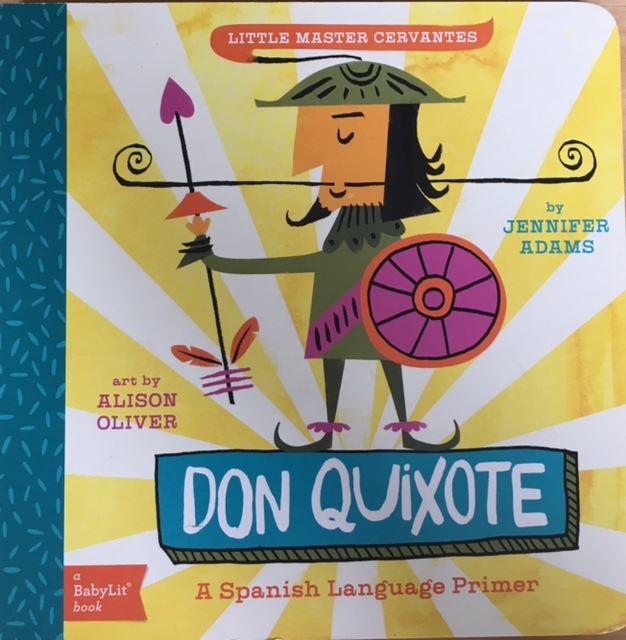 Continuing my posts on non-fiction texts, here are some suggestions of texts that you might use to engage those hard to please learners who need something a bit different to capture their attention. Firstly, some DK Readers that I bought a long while ago on Amazon. They come in several levels as you can see below, ranging from one sentence per page plus reinforcing illustrated vocabulary through simple sentences using repetitive language to the inclusion of information boxes and fact files and beyond. 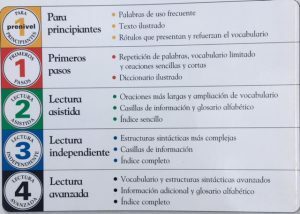 The three I have come from the lower levels as they were bought to be accessed pretty independently by learners, and are on topics that I don’t specifically teach so the vocabulary is mostly unknown. 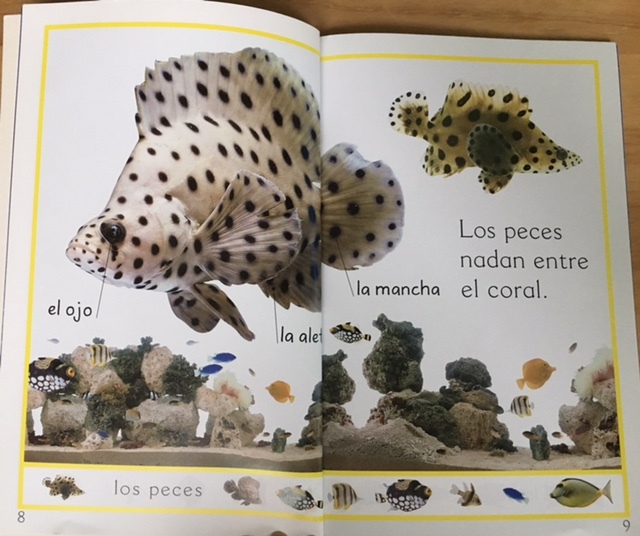 This is taken from El Mundo Marino which belongs in the lowest level ‘prenivel 1 para principiantes’ and I used this with Y1 last year when they were looking at the seaside. I read it to the class, focusing on the names of the things found in the sea rather than the meaning of the phrases. It was then left for reading during the week by anyone that fancied and also as an activity for those who finished quickly. 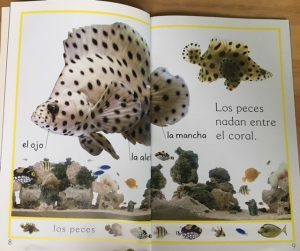 Perhaps you could encourage learners to label a picture of a sea creature using the book as a reference? 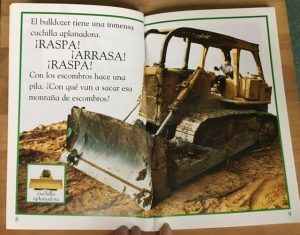 The second book is called Gigantes de Hierro and was bought when I had a pupil who was obsessed with vehicles. I now know a little boy who would very much appreciate this book! It contains some great pictures and I found it fun expanding my heavy machinery vocabulary to include un camión de volteo, una aplanadora and una carretilla elevadora. 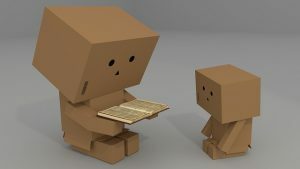 Of course, it’s good for a bit of role reversal with learner teaching the teacher new words; just proves nobody knows everything! 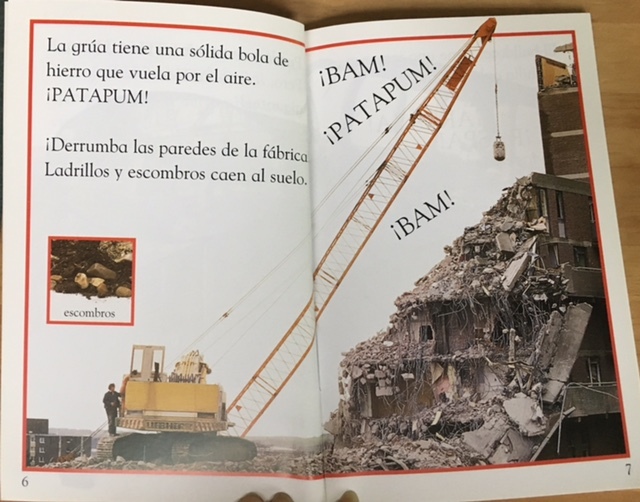 It’s a good book to read with a child or to a group of children, particularly with the onomatopoeia! 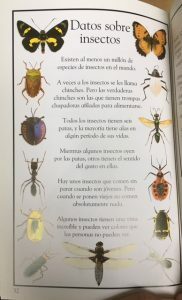 What is the name of that insect in English? 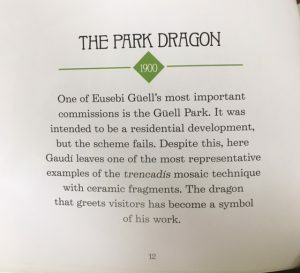 Use the text to help you if you don’t know. 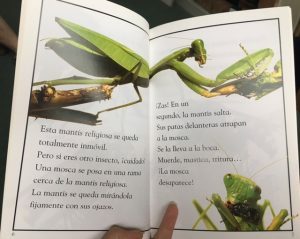 We call it a praying mantis – do you think the Spanish name is similar? Why? What do you think ‘inmóvil’ means? Why? How do you say ‘Its front legs trap the fly’? I like the fact file at the end too which,if anything, is the most accessible as the facts are so short. 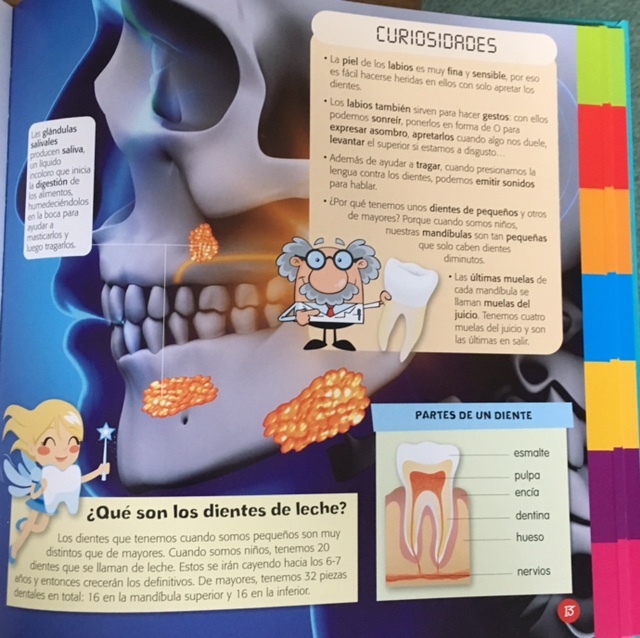 I’d have translations of each fact and ask learners to match them up with the Spanish as an extension activity perhaps, or as a little challenge! 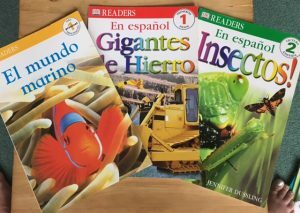 If you search DK Readers Spanish on Amazon there are several including El Mundo Marino and Insectos although most come from the USA so beware the postage! Deportes de riesgo – El vestuario de pegatinas I bought this book at El Prat in Barcelona last year as I was about to embark on sports with a particularly feisty Y6 cohort and needed all the ammunition I could get to keep them with me for the last half term! 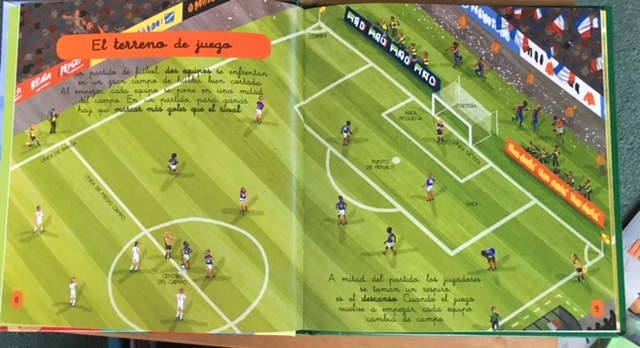 Every time we learn the vocabulary of sports there are children, usually boys it has to be said, who want to say that they do activities and play games other than the ‘stock’ ones like football, rugby, basketball, swimming and horse riding. And why not? 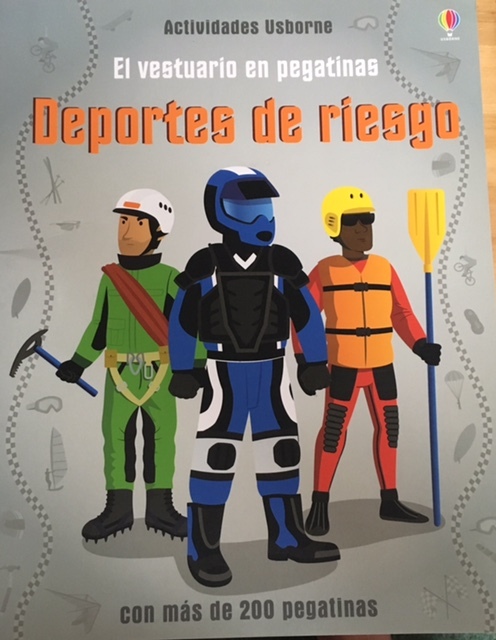 I’m forever encouraging learners to be imaginative and ‘make it up’ in Spanish lessons so I can’t really object when they want to say that they go scuba diving or skateboarding. And this book covers, as the title suggests, some marvellously dangerous and unusual sports. It not only gives the name for the sport, but also talks about the equipment required which fits perfectly with the Light Bulb Languages unit that looks at sporting clothing and equipment to explore the definite and indefinite article. 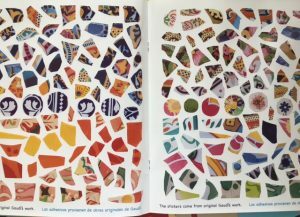 Again I wouldn’t let them use the stickers on the pages but I’d use the stickers on card and cut out to ‘dress’ the sports people, or indeed use the central pages as a picture dictionary which is what I did last time I used it. If I can bear it, I might even separate the pages of the book and use the pages as ‘laminas’ with questions associated with each, as well as reading activities to dress the people in the images according to written instructions. 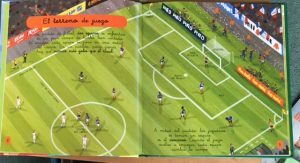 One complaint about this book – there are four female sports people and over thirty male. 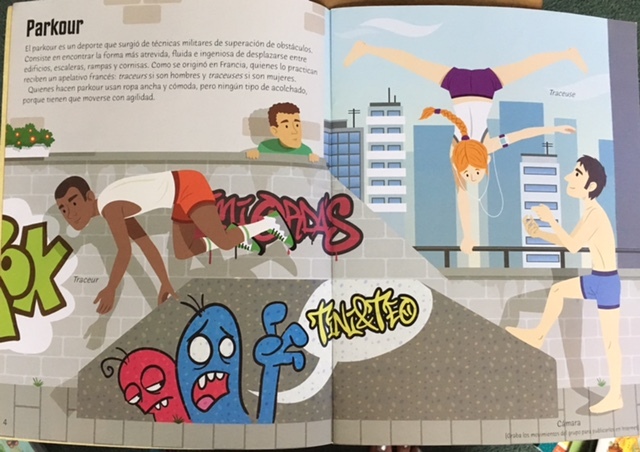 Girls like dangerous sports too, Usborne! They’re attractive with amusing illustrations that draw you in so can be enjoyed even if you don’t understand a word! The text is in Spanish handwriting which is again novel, adds something to the reading challenge and is a good way to add a bit of culture and ‘authenticity’ as well. The texts are presented in short chunks using bold to pick out key words. Being a football fan, El fútbol was the first one that I purchased, attracted by the cover that features La Selección winning La Copa Mundial with recognisable drawings of players (although Iker Casillas has strangely got very dark hair and a huge chin!) 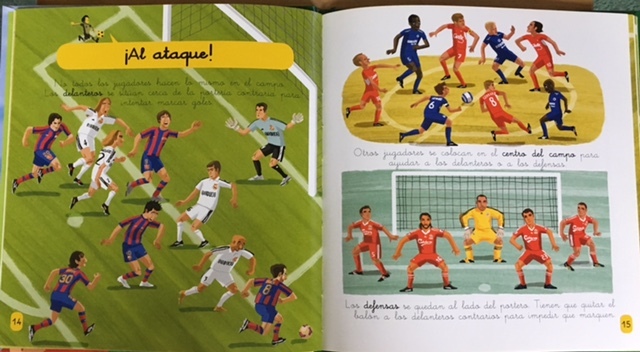 In fact there are players throughout the book that learners will recognise including Frank Lampard, Bufon, Gerrard and even Gary Lineker. 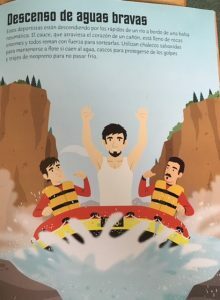 I like the combination of prose and labeled images, and the balance of images to text is about right to not put off reluctant readers in UKS2. 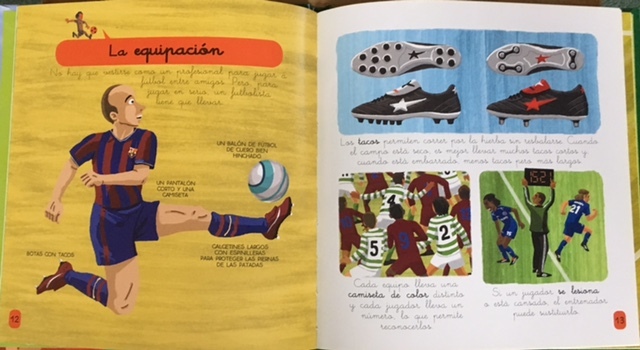 As with previous books, I’d be happy for learners to access them individually and use the pictures and their knowledge of football in conjunction with language learning skills to read as they wish. 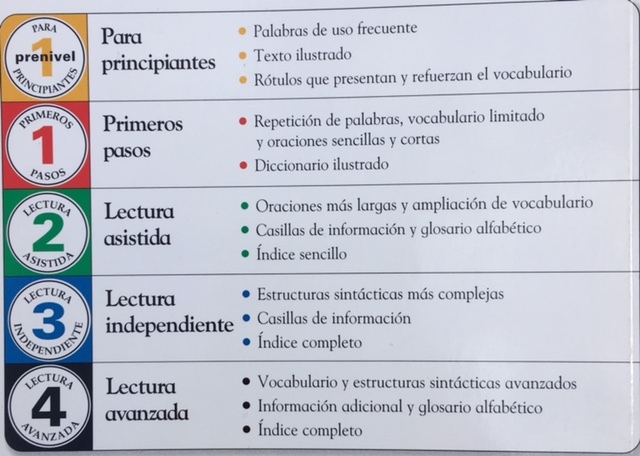 To offer some guidance you could produce a list of key words and phrases in English and challenge learners to find the equivalent in spanish, perhaps giving them the page number as a clue. 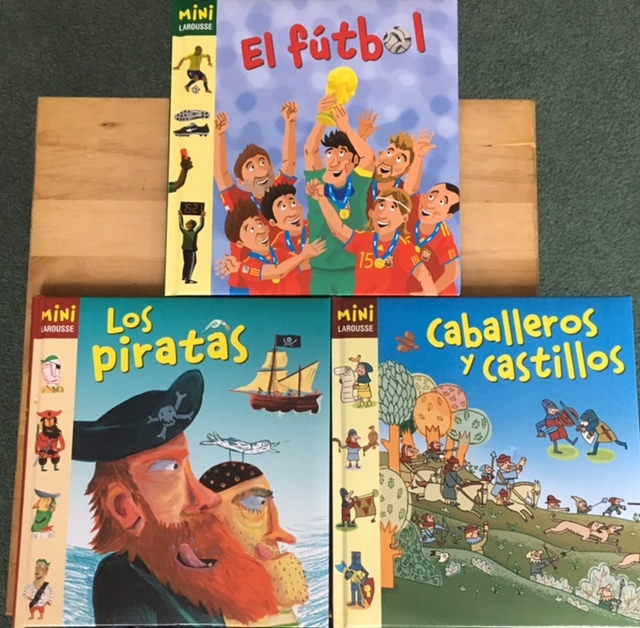 And then there’s Los Piratas which is a bit advanced for the KS1 topic on treasure but great for reading for pleasure. 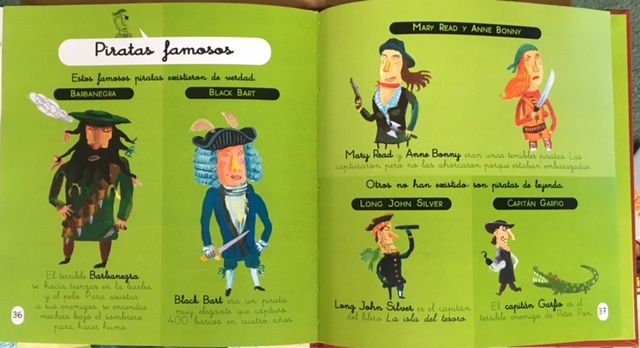 Good to see some famous female pirates featured in this book! 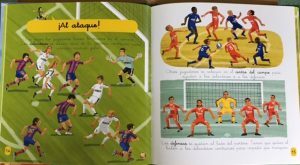 You can purchase El fútbol and Los Dinosaurios in this series from Little Linguist. Other books include El Universo, La Prehistoria, Los 5 sentidos and El Cuerpo Humano. Any ideas you’d like to share? Leave a comment below! Following on from my last post about a couple of non-fiction books I bought in Bilbao, I’ve decided to share some other non-fiction texts that I’ve collected over time. 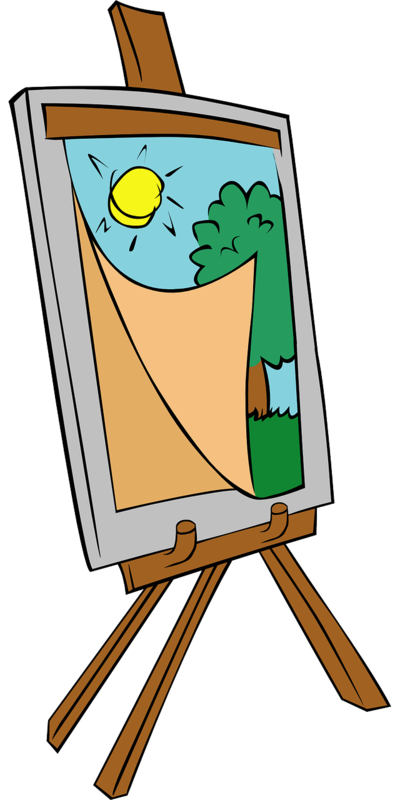 In fact, I’ve concluded that I need to do it in several posts as there are quite a few, so here is part one which includes some ‘arty’ books! By arty I mean to do with the arts not just about artists although there are quite a few that fit that category. 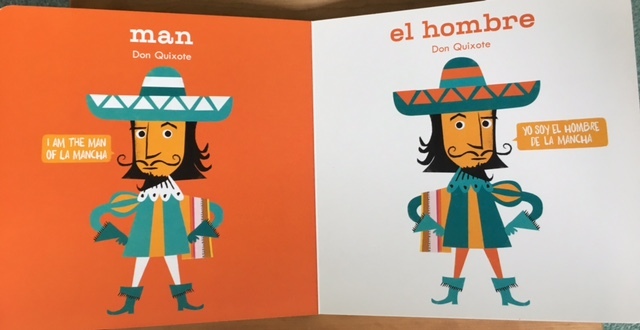 I bought this lovely board book last year to share as part of the celebrations of the 400th anniversary of his death- and that of Shakespeare. 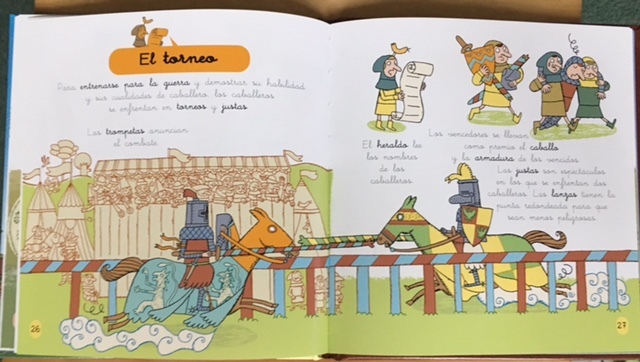 It is essentially a word book with the left page in English and the right hand page in Spanish and intended for very young children; however, used in conjunction with this song from BBC Bitesize ClassClips, it gave a stimulus to introduce and discuss the most famous work of Cervantes in a simple and unthreatening way. 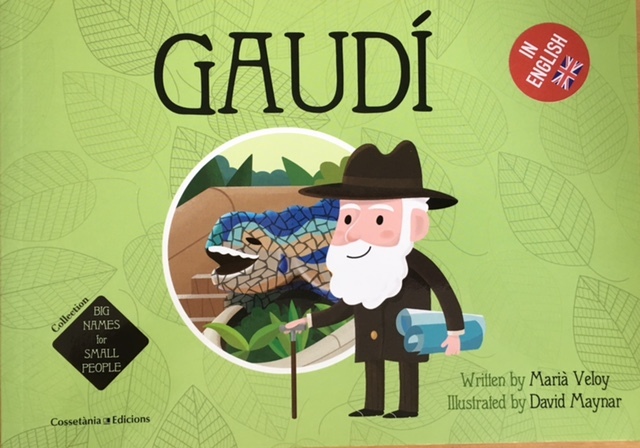 This book forms part of a series called Big Names for Small People and my copy is in English although you can buy it in Catalan (and soon in Spanish – see the link below) I am a great fan of Gaudí and his story is so interesting that I really enjoy sharing this book with young learners porque si as well as in the context of our learning about Gaudí’s artwork when we discuss shape and colour. It’s also particularly useful for looking at timelines, chronology and working out how long ago things happened. 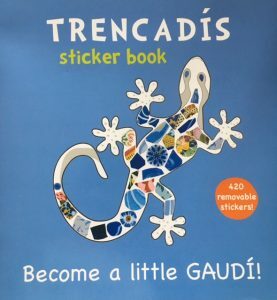 It contains no words, but I also use Trencadís with the above book. 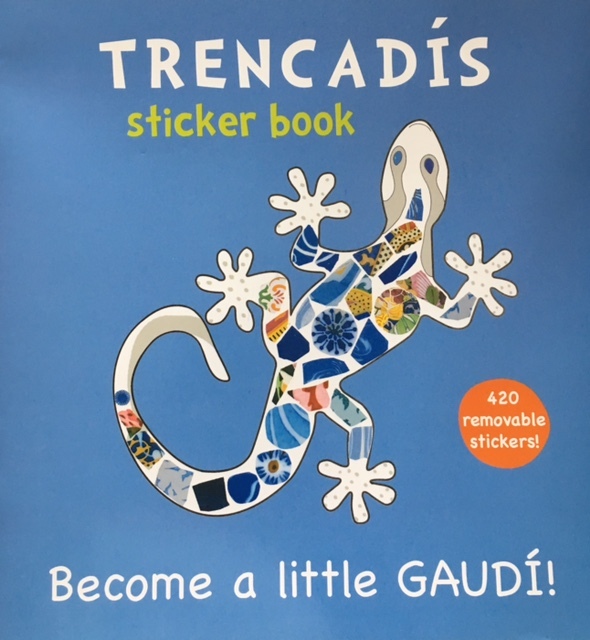 It’s a wonderful sticker book with outlines that you fill in with stickers that are taken from photographs of Gaudí’s original works so children get to be just like Gaudí without the mess of smashed crockery! 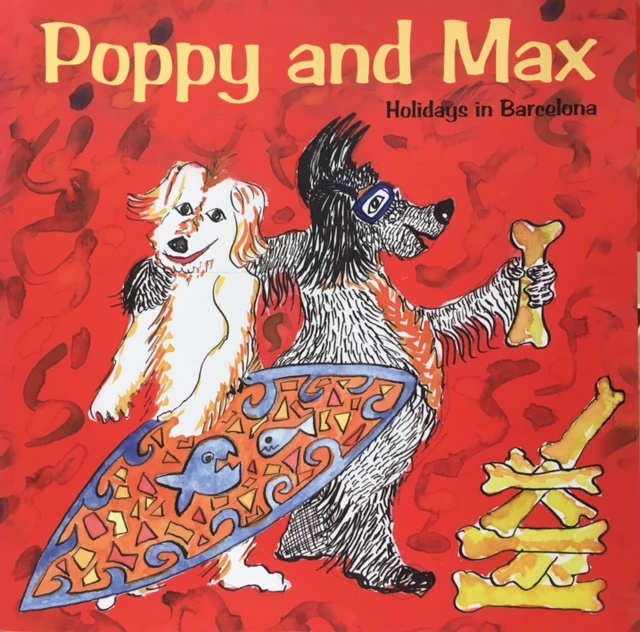 And finally, before we leave Barcelona, here’s a storybook in English that gives a flavour of the city through the eyes of two dogs called Poppy and Max. 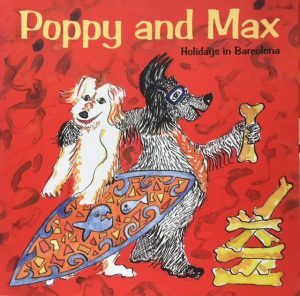 Poppy and Max – Holidays in Barcelona is a work of fiction but I thought I’d share it here as it’s in context! My final book (for now as I have more at school that I’d like to share!) 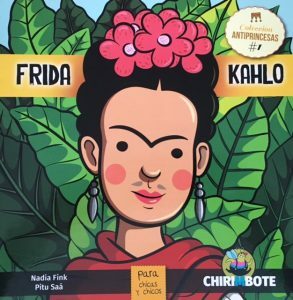 belongs to a series that has attracted lots of attention and centre round the life and work of Frida Kahlo. 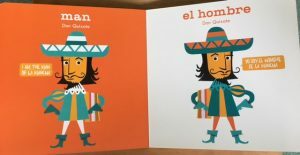 It’s completely in Spanish and whilst the chunks are fairly short, it’s not the sort of book that you could expect children to pick up and understand without guidance. 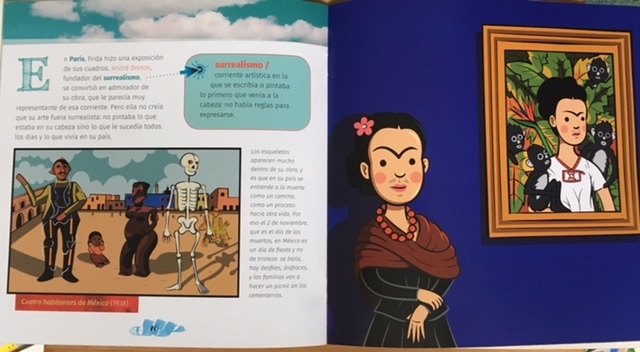 I like the small blue boxes that give definitions of key words like surrealismo and revolución, and also the stylised drawings of some of Frida’s works alongside photographs and pictures of her actual work. A fascinating woman! Below is a video of the book being read in English, and you can see it in Spanish by following this link and forwarding to about 12 minutes. The link that promises a lesson plan based around the book is broken but I’ve tracked it down to here – it includes some excellent ideas not just based around the book but also around promoting women and being ‘antiprincesas’. I hope this selection of books has been of interest. I’ll share more in my next post, focusing on books with a scientific theme. 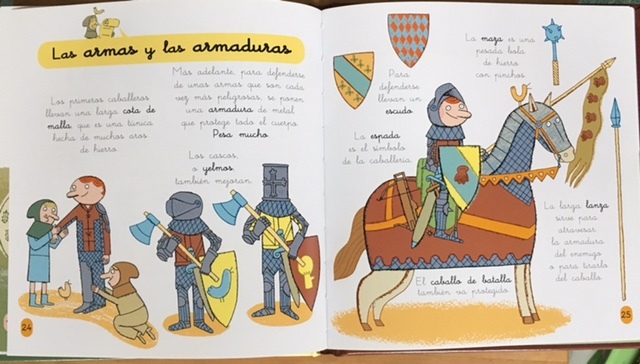 Continuing on my posts about books I bought in Bilbao, we come to a couple of non-fiction texts that I bought at the Día del Libro market. 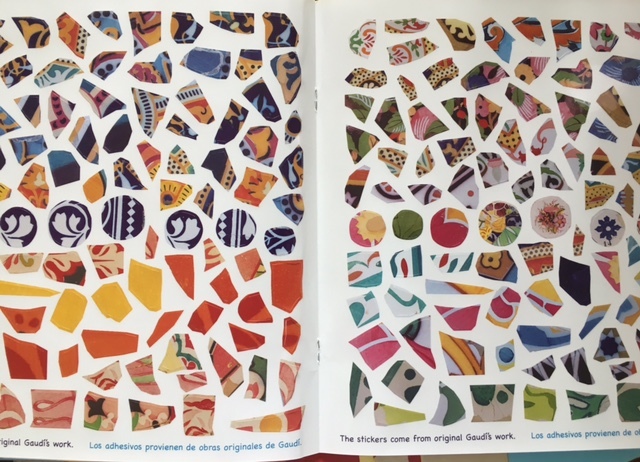 I was drawn to them as they are colourful, very visual and were also very reasonably priced at €5 (always a consideration when I’m buying several!) 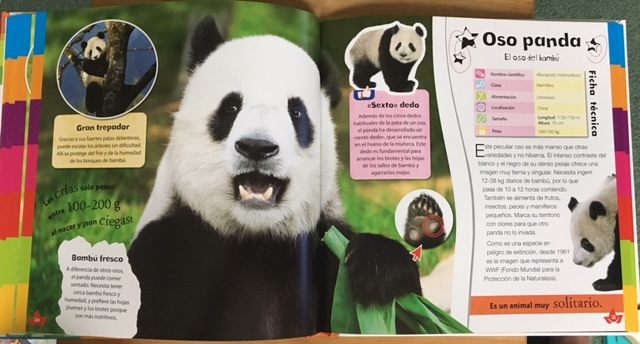 Non-fiction texts are less readily available than storybooks and it can be tricky to find ones that are appealing as well as accessible to primary school learners. So I was really pleased to find these. 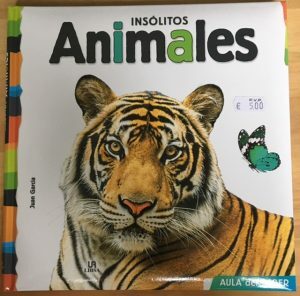 There are four in the series Aula del Saber and I selected these two as I already have books about the planets, and dinosaurs is a topic that y1 cover. 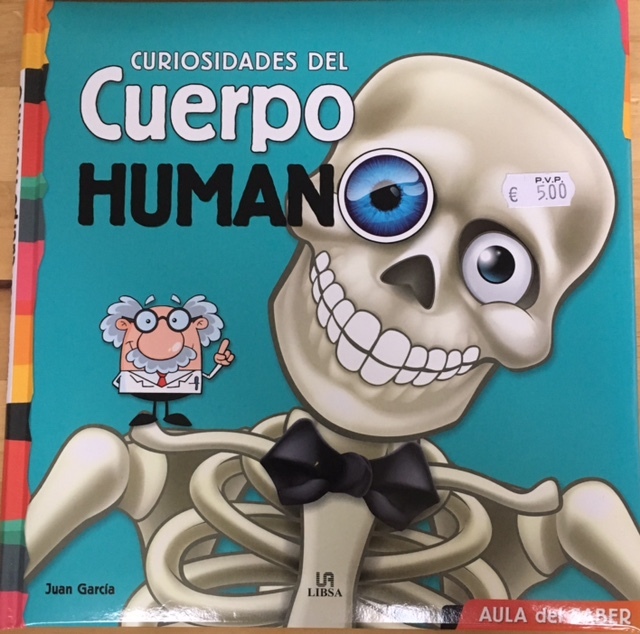 Firstly Curiosidades del Cuerpo Humano, chosen as it supports the Science curriculum as well as containing pages that will be useful for Health Week. For example, this page will be useful to Y1 who are looking at dental health in Health Week as well as Y4 who look at what happens to our teeth, completing experiments using egg shells and Coca Cola! Y5 are looking at life cycles and human reproduction so the page above would be interesting. 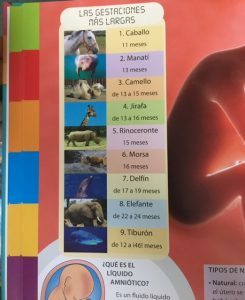 As you can see, even without knowing much Spanish you can understand that the table shows the gestation times of various animals. 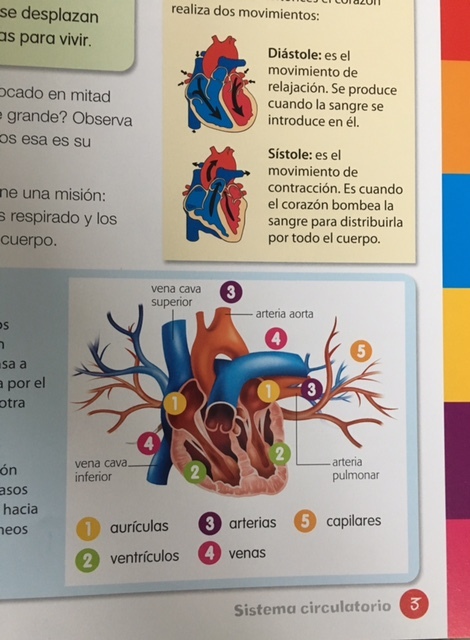 There are several pages that outline the whole process of reproduction including the female and male reproductive system so it’s perhaps not one to put in the school library but rather a resource to be used in context. I like that the information is on bite size chunks and that there are lots of diagrams and images to support understanding. 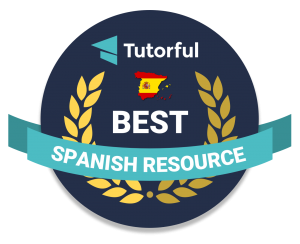 This section would be good for finding cognates. And the second book is Insólitos Animales which has a similar mixture of short texts, diagrams, tables of information and Did you know..? sections. I’ve selected a few pages that drew my attention. 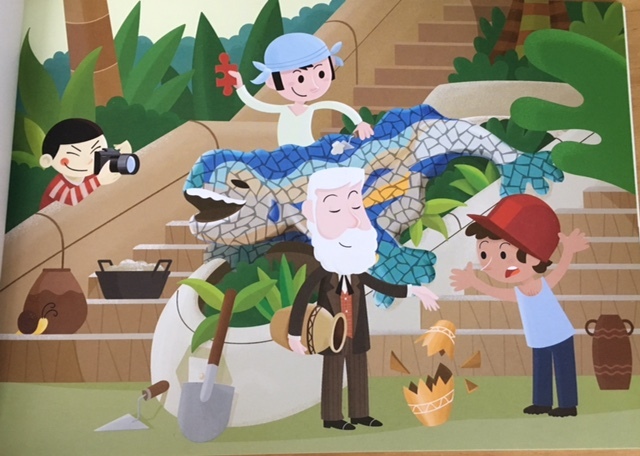 This one could be the stimulus for a sorting activity, giving learners a list of animals to classify into groups and create simple sentences e.g. Una ballena es un mamífero. 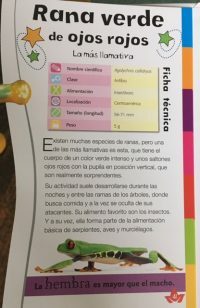 Una rana es un anfibio. Some interesting vocabulary in the tables below; learners could follow the model and complete for other animals. 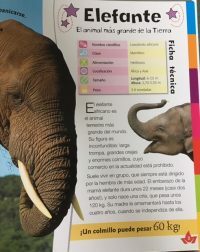 The short texts could be used for a ‘Find the word for…’ activities as well as simple comprehensions that guide the learner through the text, calling on their existing knowledge of elephants/frogs as well as their linguistic knowledge to respond. Y4 will finish their unit on animals before the end of term so I think we’ll have a look at this book together! And I’ll let you know any further ideas we have to use it. ¿De dónde viene el yak? 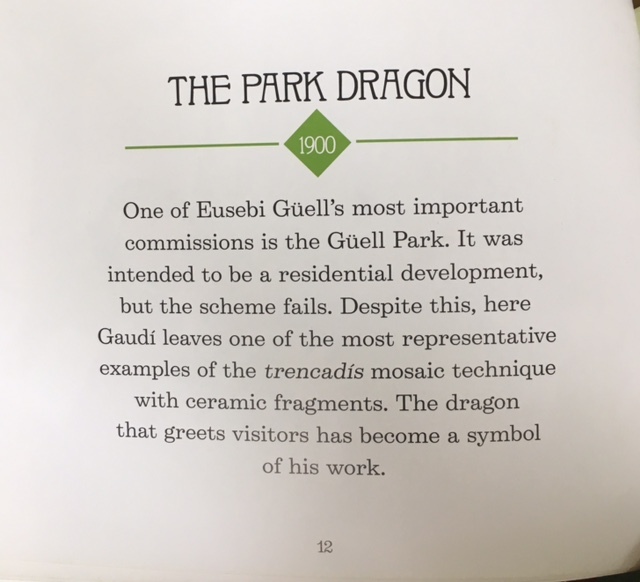 my own non fiction text written using Storybird.